When the NF1 basketball timetable was released the date of 22 November was put in our diary because of the opportunity to see how Illkirch-Graffenstaden is coping in NF1 and because one of the most successful products from their junior programme Mélissa Micaletto was coming home. Actually Micaletto lives less than five miles (8 kms) from the hall of the SIG during the off season. Micaletto left the club at the end of the 2005 for Mondeville. During her time at Mondeville she won every youth honour possible but never had the opportunity to play against the SIG. The pleasantries were quickly forgotten as soon as the game started. The SIG had the better start. Back to back three-pointers by Céline Schmitt-Sender and Marie-Noémie Privet gave them an early lead (12-6). Nice then took over and with Marie Bacquet working the paint well the two sides were soon back on level terms (14-14).Both teams started to contest every ball. Just as it appeared that the SIG had gained control Johanne Gomis hit a shot from beyond the arc (20-22). Allison Verneray and Schmitt-Sender came up with back to back scores in the paint for the SIG to edge the first period (25-20). The SIG stretched their advantage (29-20) early in the second quarter. Nice adjusted their defensive position and stopped the home side from scoring while they scored 5 points. Aline Fischbach ended the Nice sequence as she split a pair of free-throws which she quickly followed up with a three-point shot (33-25). The game went through a very technical phase that was broken by Micaletto as she scored her first points of the game with a three-pointer (30-35). The SIG played to strength in the paint and with another Fischbach trey led by more than 10 points (43-32). 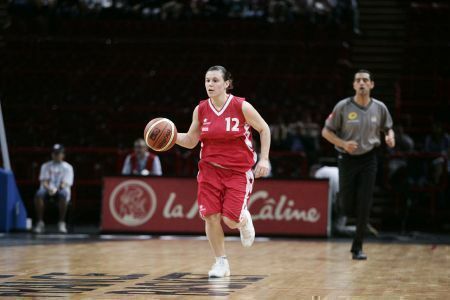 Alina Slabecka started to cause problems for the SIG as Nice tried to reduce the deficit. The home side went into the break leading (47-38). The third quarter belonged to Nice. They won most of the one-on-one contests with in particular Micaletto having the advantage over Aminata Konate. Nice reduced their deficit to a single point (53-54). The SIG weathered the storm and went into the final period still leading (60-56). Nice finally drew level through Elodie Gerard (60-60) with eight minutes left to play. The next seven minutes was end to end basketball with bodies flying all over the place. Tempers began to flare as the game was tied on numerous occasions. Micalleto was to tie the game for the last time (71-71) as the game entered the last minute. Bacquet was to foul out of the game as she made contact with Schmitt-Sender with 50 seconds left to play. Schmitt-Sender split the pair of free-throws to put the SIG in front (72-71). Nice went back in front after Schmitt-Sender mishandled a ball and Gerard got onto the ball and eventually scored for Nice (73-72). The game turned sour with about seven seconds to play when Slabecka (right) was called for a foul on Privet. This was Slabecka' fifth foul so she had to leave the field. An argument broke out with the officials and a technical foul was called. This resulted in 4 free-throws for the SIG. Privet and Schmitt-Sender scored 1 each for the SIG to take the lead (74-73). Nice had no choice to foul a player from the SIG. Micaletto committed her fifth foul on Darline N'Soki and also had to leave the game. N'Soki scored her free-throws and the SIG won the match (76-73). It was not a nice way for the match to end. Sender-Schmitt led the scoring with 23 points. Privet scored 14 points while Verneray compiled a double-double 12 points and 13 rebounds. Fischbach scored 10 points and dished out 6 assists. For Nice four players finished in double digits: Slabecka, Gomis, Micaletto, Gerard with 19,15, 12 and 11 points each.